Securing Pakistan’s economy is the key to securing its borders. The events of the last few weeks have underlined the need for Pakistan to invest in robust defence. While we can take a lot of pride in our military’s protection of our borders, it would be foolhardy in the extreme for us to allow these events to significantly inform the way forward. We must, instead, take stock of deeper and more powerful dynamics. For decades, Pakistan significantly outperformed India in many ways. Our economy outdid theirs: in 32 years between 1961 and 1993, Pakistan’s economy grew nearly twice as quickly as India’s. In military conflicts, while India’s size always led to eventual advantage, Pakistan leveraged a close alliance with the United States to give as good as it got in the 1965 war. Even in 1971, Chuck Yeager — a top American pilot and the first man to break the sound barrier — was deployed in Pakistan in close support of the Pakistan Air Force. Pakistan even enjoyed supremacy on the cricket field for decades. These facts, undeniable and culturally salient, cemented the idea of relative strength in our national psyche. It is equally undeniable, however, that India has reformed and Pakistan stagnated over the last 30 years. This is well documented, but has not reflected in significantly updated beliefs in Pakistan. Part of the reason might simply be mental inertia; part of the reason might be that economic strength takes time to manifest in diplomatic and military consequences. India initiated economic reforms in 1992, but it took more than a decade for the US to start investing seriously in its relationship with India, firmed up with the two countries’ civil nuclear deal of 2006. Militarily, change is even slower: relative capabilities are as much a reflection of past economic performances as current ones. Consider that the MiG-21 shot down in late February was a type that India first acquired in 1964, and that Pakistan took first delivery of the F-16 in early 80s and signed the first Memorandum of Understanding in 1995 leading to JF-17 production two years later. Our respective resource envelopes in bygone years affected our defence procurements, and thus had a bearing on the events of February. By the same coin, we must understand that our past growth deficit creates a defence imbalance overhang: over the next decade or two, India will reap the strategic benefits of investing in its economy as its superior military acquisitions come on line. It is the size of an economy that determines a country's ability to spend on it defence. If Pakistan fails to undertake serious economic reforms, our stagnation will further worsen our military imbalance with India. Let us review the scale of Pakistan’s economic decline relative to India. In 1991, the Pakistani economy was 17 per cent as large as India’s. By 2017, a decade-and-a-half of being outmatched on economic growth has left us less than 12pc their size. This is a 41pc decline in our relative economic strength. Due to the sheer size of the Indian economy, reforms there have quickly increased their size advantage over Pakistan. In the five-decade period between 1963 and 2002, India generally grew slower than Pakistan, yet there were six instances of India’s annual economic growth exceeding the size of Pakistan’s entire economy. More worryingly for the strategist, in the 15 years since 2003, India has achieved this feat nine times. India’s size and robust growth has allowed its military expenditures to increase vastly since the 1990s, while falling slightly as a percentage of gross domestic product (GDP). 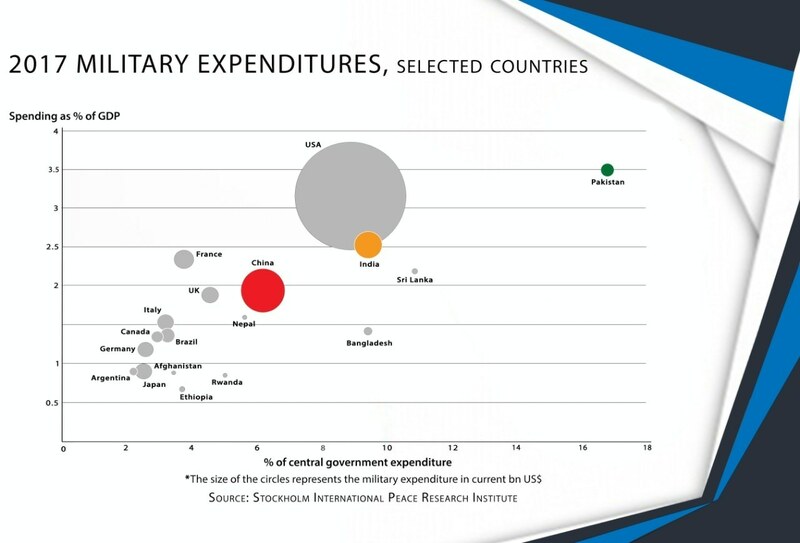 Living next door to a strong adversary, Pakistan spent decades with the largest proportionate expenditure on defence in South Asia, but decreased defence spending significantly in the 1990s. A simple, but fatal reaction to increased tensions with India today would be to once again increase the proportion of our government revenues spent on military spending. In fact, some scholars speculate that Indian defence planners may actually be interested in provoking us to do precisely this. This would be suicidal: a rise in military spending today means less money to educate our children, invest in our infrastructure, support our police and courts and do all the other things that we can do to correct our economic decline. Even after the decline noted above, Pakistan’s military expenditures as a percentage of GDP remain amongst the highest in the world. There is simply little space to squeeze non-military expenditures. This presents us with a true dilemma: an increase in military spending today will crowd out economic growth and thus means paying for our near-term security by further reducing our capacity to increase defence spending in the future. If India continues growing at its 15-year average annual rate of approximately 7.5pc and we stick to our current average growth rate, its economy — and thus its ability to spend on its military — will be more than 20 times our size by 2047. Where does Pakistan go from here? Simply to return to our relative strength with respect to India to 1990 levels, we need to grow at an average of 10pc for the next 30 years — achievable, but a feat accomplished only by Ireland, China and Vietnam in the past. The key out of this mess lies in understanding that this is as much a story of our stagnation as it is of India’s rise. Since the 1980s, every major South Asian economy has improved its citizens’ health, and since 1990 its wealth, faster than Pakistan. The most optimistic projections suggest that the China-Pakistan Economic Corridor will add 2.5pc to our growth rates. Useful, but not enough by half. We will have to do the hard work ourselves: we need to shatter protectionism, slash inefficient public expenditures, invest in quality education and improve the functioning of our legal system. This requires profound, deep-cutting, unprecedented economic reform. Ironically, we can learn much from considering two determinants of India’s growth. While it stagnated economically, India invested early and well in elite public universities. This helped set the conditions for its growth post-reforms. Then, when India’s foreign exchange reserves dipped to covering only three weeks of imports in 1991, Narasimha Rao was willing to absorb the political blowback of Manmohan Singh’s reforms. As economies grow, so does the value of trade amongst neighbours. Already, World Bank estimates suggest that a failure to trade costs India and Pakistan $35 billion in lost economic value. As Pakistan grows, the gains from peace will only rise. Who knows, perhaps our economy itself will one day secure our borders within a peaceful and prosperous South Asia. The article has been updated with additional charts and analysis. Ali Hasanain is an assistant professor of economics at the Lahore University Management Sciences, and was formerly a Global Leaders Fellow at Oxford and Princeton universities. What does the future of regional trade in South Asia look like? Are insecure property rights holding back Pakistan’s economy? A great article, showing the real face of our position. Few positive aspects, still a lot of work ahead. Very good articulated Blog, it say every thing itself. Very good Insights. Time to wake up and start doing work rather than doing politics. A true depiction of affairs between Pakistan and India. 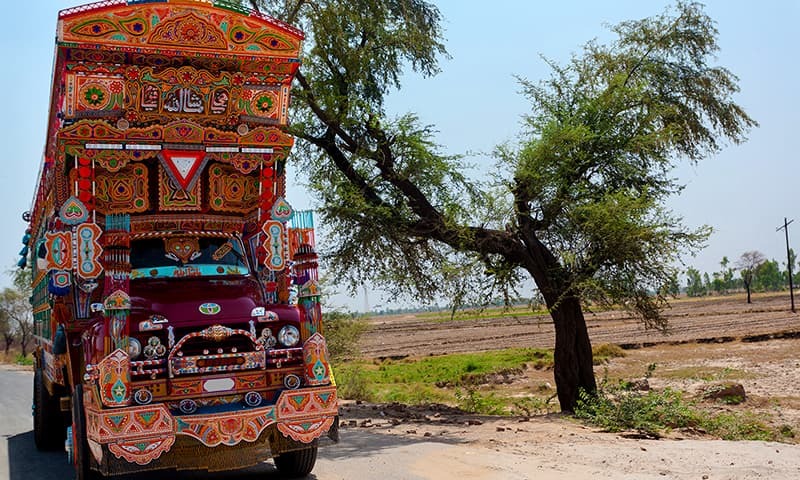 In addition to Kartarpur corridor, Pakistan can consider opening the land trade route to Afghanistan. A win win situation for all. Economic growth is not a race or battle against any country. It is simply a duty of any country/government to make living standards better for its citizens regardless of what others are doing. One country may learn from others, but fight or race against other countries is not part of economy. This is indeed without minimal doubt a well thought through article. Pakistan has a choice to make, which will shape its own destiny. We NEED to keep the peace and focus on our economy. There is simply no more space to increase budgets to our military while the basic functional requirements of an average Pakistani declines. Please, its time to wake up! Thanks for putting this so succinctly. Time to stop looking to the past and face the future now. As someone else mentioned here... a long road ahead. Excellent article. Continued hostility is lose-lose for both sides. Co-operation is win-win. Both sides should come to common agreement on Kashmir and move forward on other fronts. I thought the great PAF downed 2 Indian jets ? Well.... a good informative article... of the truth and reality... the concerned has to realize this!!! Very good article .sane voice. well done mr hasanain. the current govt has a lot of work to do. pakistans peace initiatives with its neighbors must be lauded. there is clearly a strong realization in military and civilian circles that the current path is unsustainable. we need to compete and prepare our population for the next 50 years. An eye opening article... but who will learn from this?? Great article! We don't want a war, but certainly need to shape up the economy. A war is a ruin for both Pakistan and India. Our situation is like that of the US and Russia. Both have enough power to destroy each other, but economically there is a pretty significant disparity. salute to your writers, pakistan has good quality writers, comparable to anyone in the world. An eye opener article for the people of Pakistan and media, who portrait an image of "we are the best". If you want yourself to compare with India, you have lot to do. Great. Now there are signs that India is likely to push its defence spending to 3% of its GDP (or to $80 billion). They expect us to match it (by increasing our own defence spending by 50%). If we fall into that trap it will be USSR vs USA all over again. The real problem of course is our population growth rate. While India's is at 2.1 and falling ours is over 2.5% and falling at much slower rate. Unless we do something about it (like using madrassas to teach the importance of family planning) we lose. That will be real jihad. Good analysis but fail to recognize that inia will never be our friend and will never forget to harm us and this is the truth, however, we need to improve and that can only happen when we will get rid of corrupt leadership. We did it in the past and can do it again. Amazing analysis.. This is critical thinking that's sorely required. It's easier to down a plane than to fight a 1 week war. It is very clear from this article that defence expenditure is eating Pakistan economy and influencing negatively every growth parameters. Accurate analysis. Peaceful coexistence is the only solution and option if we want our future generations to prosper and live in peace and tranquility. Excellent article. Eventually It’s all about money. Economic disparity that is currently being created will eventually lead to unsustainable competitive scenario for Pakistan and neither China nor middle eastern countries will be able to filll that gap. The most sensible thing to do will be set anmosities aside and join in economic growth and betterment of people. Kudos to the author for this insightful policy piece. And kudos to Dawn for its courageous reporting. You can only start fixing a problem by recognizing its root causes, stopping the slide, and then reversing course. Pakistan has seen its dark days, but is turning the corner. With effort and hard work, the country can start prospering again. A very balanced and informative article. We should also not ignore the great potential of generous trade growth between the two countries as its benefits would be both financial as well as stronger and better relations. While India can provide many items such as medicines at prices unmatched by any other country, Pakistan can give a run for money in many different fields. Basically, it's this type of thinking focused on welfare of people that would provide an exit from the current conundrum. Not an Indian jet but two Indian jets. An eye-opener analysis by the author. Imran Khan urgently needs to reverse the country's decades-old foreign policy with India to save Pakistan from an imminent economic collapse..
A big problem explained in very simple words. And the graphs spanning several decades helps understand where the problem is. Hope the decision makers act in public interest. Excellent data driven article. One of the reasons the western countries trump others in pretty much every sphere is that they understand the power of data and try to adjust their behaviors based on the existing data and the outcomes they desire. In our part of the world, we treat data with contempt at worst or convenience at best. We use emotions and rhetoric to drive our choices and the results are there to see. Well written, but for your records, we did shoot down two jets and not one. Overall subcontinent do not deserve the war or expenses on military... Education, Health and projects for reserving the natural resources, including Water, should be the top priorities. You have written a great article on real problems of our country. Wish, powers that be can pay heed to it. All the nations who invested in their people reaped a rich harvest, most of our well wishers are showing us the similar paths, someone has to listen. Pakistan needs to tackle with population growth which is one of the highest globally, its doubling every 25 yrs. Also, developing better infrastructure and funding mass education should be its top priority. Having honest, dedicated and stable government will be the key. 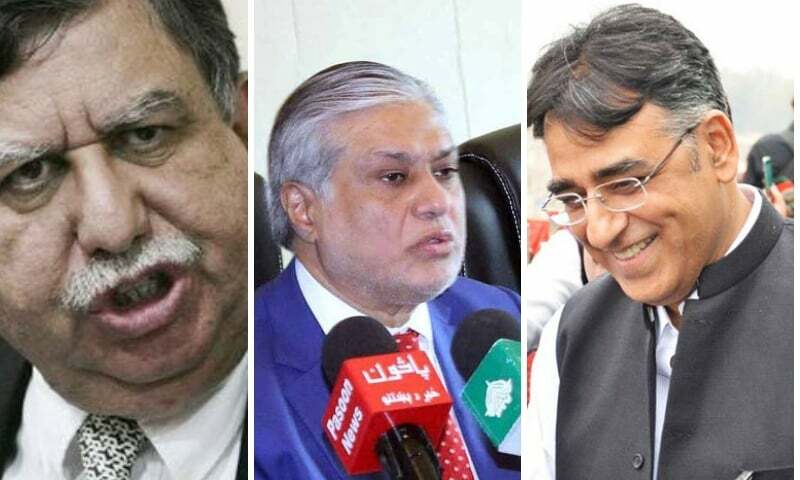 Nicely and correctly pointed out ..... goes to show the state of the economy left after ten years of Zardari and Nawaz's rule and the disastrous policies of Mr. Dar who is hiding in London as a absconder from the law.....and I am convinced this was deliberate and not by default. Very good and eye opener article. Pakistan must look after its economy first. Very nice article that is based more on fact than rhetoric. Hope leadership on both sides pay attention. Great deal need to be done for the upliftment of the common man of both countries. Writing on the wall is clear if one doesn't want to see then none can happen. The issue is education. Chinese and Turkish companies can not move their factories to Pakistan when our population can not operate those factories. We need to educate our people just as China and Vietnam have. Once the school system is improved and malnutrition is address and resolved then we can get 10% growth rate or even a super hot 20% growth rate. We need overseas Pakistanis to send their dollars to Pakistan to educate the people here. We need them to volunteer to teach in Pakistan and get them to work with Pakistani companies to get them and see what is going on in the marketplace. Great article! Well analyzed, hope Pakistan Govt policy makers will read this. what a sensible thinking! i hope we have this type of people on both side. Unless we eradicate corruption and propagate merit, nothing will change! Very well researched and written article. Pakistan stopping its fixation on Kashmir will help Pakistan, Kashmir and India in that order. India can be easily Pakistan's biggest trading partner if we somehow focus on growth instead of on killing each other. Pakistan’s population growth rate is double that of India and this results in lower economic growth rate as more money has to be spent on dependants. Excellent article. Economy and the development are the areas where India and Pakistan should compete, instead of battle field. Very good article. It is not only for Pakistan for all the countries in subcontinent. Although article focus against India. Both countries should look for bigger picture and compete with west, china in every aspect. A very fact based good article. 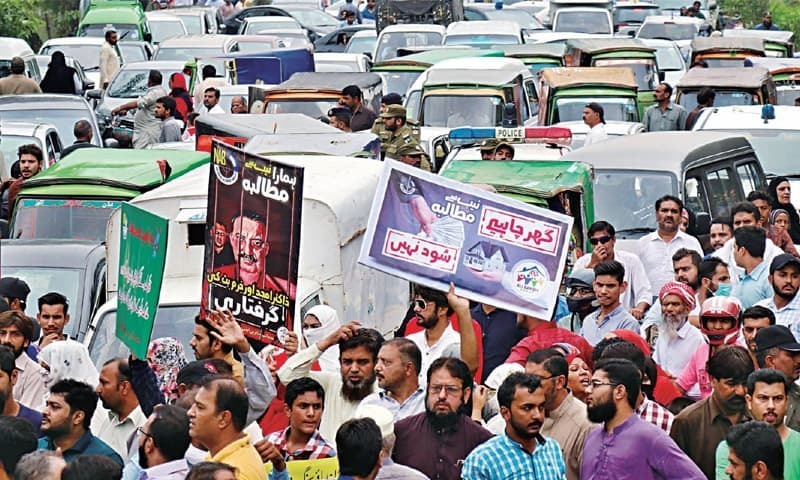 In 2019 Bangladesh economy will overtake Pakistan economy. After a long time an article with some objectivity and sense. Kudos for a Brilliantly written article! Very impressive. Nice Article... needs these sort of articles to abridge the differences.Impressed with the GDP Graph.. Salute you sir for writing the facts. Before Word War II Japan wanted to dominate all of Asia, militarily and failed. But it rose from the stupor, with the help of its economy and surpassed not only all of Asia, but also the USA & Eurpose, in many ways. Wow! What an article, dawn has one of the best collection of quality writers and that's the reason why it is one of the best newspapers. Very well written Prof. Ali. Depth of your research & ease of reading makes distinct impact on the reader. This article also reflects the intellectual talent we have in the sub continent. Keep up the good work & all the best for your future endeavors. Pakistan just needed a leader who would take right decisions and we got one. Come back in 5 years. Pakistan potential is immense. Refreshingly positive. A better economy goes beyond securing your borders. It provides choices to the people and raises the quality of their lives. It's time to get out of the security syndrome. A really nice article showing that pride lies in economic prosperity. Well fact of the matter is that there is no comparison whatsoever between India and Pakistan either on economic or military fronts. India was a sleeping giant that has achieved tremendous success in economy and that is just a 25 year story. Next 25 years will make us a economic behemoth in the leagues of US and China. Pakistan should compare herself to the likes of Bangladesh ( far better economic growth rate) and Sri Lanka..
Pakistan should provide liberal visa and freely allow us for touring Pakistan visiting hindu temples, ancient historical sites and enjoying traditional food of various cities. @F35econmi, how will that serve you. You r a free man to compare India with USA, who is stopping u. Why not help each other in coming up ? ?there are good points and bad points, advantages and disadvantages in everybody, we can help you - you can help me.. when not this attitude ??? It is time for Pakistan to invest in their children instead of sprucing up their defence. A well educated child can grow up to be the greatest asset of a nation as has been proved in India. Today, it is Indian workforce that remains at the helm of the IT revolution world wide and no country can hope to ignore the nation. The women of India are standing shoulder to shoulder with the men today too thereby taking the nation economically forward. It is time that Pakistan understood the truth and backed its women too instead pulling them backward by propagating gender sterotypes that are not valid any longer. No nation can prosper by ignoring half of its population. Imran Khan should do well to make peace with the new Pakistani women. Outstanding. Facts and figures, no stories. @Ali Kazmi, why stop at two make it four.. I hope the leaders of Pakistan read this article and create a turning point in its history. Does that mean that for the past 30 years Pakistani leadership and affluent citizens have outpaced everyone else in the world in offloading funds to offshore accounts? The first thing is security. Defense spending must be raised. @Dev Mehta, What are those fields? this well written article is an eye opener !!! Bravo professor! @iqbal Ali, well said sir. Very well written article. We the people of sub-continent don't want WAR. We should learn from our past and look forward to built our future together. This war hysteria politics will only bring chaos in region, will bring more poverty, more unsuitability and more deaths. Let better sense prevail. Excellent article , both countries do not waste money of entire nation for an insignificant piece of land. Security should be love your neighbour but do not pull down fense . best way destroying an enemy is to make him a friend. spend all money on economic developemt ,Real Education and less on defence. Four types of education system resulted in social imbalance and internal conflict in Pakistan. Govt should bring national unity by reviving an integrated same education for all pakistanis upto junior school. This is the eye-opening analysis. The government of Pakistan should take action seriously now for economic growth. An article based on facts. For just 1.65 crores Kashmiris, Pakistanis destroyed one of the strongest and most resourceful and liberal nation in South Asia, and transformed it to the most underperforming nation in the world. Pakistan is making same mistake of former USSR. Military power without strong economy. For India, its additional defence spending is more than enough to provide education, health, and shelter for all. They can bring 22% of its below poverty population out of poverty. The author has not considered survival of the country. If the nation doesn't survive how can it achieve economic growth? With issues from all sides it is imperative to keep the forces updated. Many lessons for Pakistan policy makers, if they want to learn. Very precise and informative and non biased information. Thank you sir. India's population growth rate is 1.2% and not as mentioned. @D patel, Beautifully put!! Why this comparison with India- economic targets are self defined, this is not a race! society to grasp the reality of 21st century. Forget the K word, focus on the issues at grass roots for the mass. It is in the interest of the Elite to keep the mass without it. Excellent!!. We pray that the wishes expressed come to fruition .Let all prosper. a great article. Simple comparisons of economic performances between two south Asian countries yet with profound lessons to learn from. Our govt is bent upon looking for short term fixes for economy. This seems unlikely to work for our battered economy. There has to be deep rooted reforms and as the writer aptly concluded, significant investment in quality education. Very well articulated . The theme is economy is power. You can provide good education, medical facilities, over all quality of life to your citizen . Lets fight these epidemics on priority. very well written . but growth comes when all our scare resources are used efficiently for productivity . rule of law and ease of doing business , availability of water , power are some other requirements . I hope pakistan will start allocating resources wisely. A mind blogging article. How many of our economists understand this! How can we slash down our military expenditure, does national action plan come into the picture! What is way forward in terms of increasing our national revenue and cutting down our non-productive expenditure apart from our military expenditure. I would like to read any of your articles on this. We need perhaps a kind of economic emergency perhaps.